Bournville Old Jamaica has seemingly disappeared from the shelves and frankly I have been mourning the loss of it. Whilst doing a mad dash Sainsbury’s shop the Fathership spied Ritter Sport Rum Raisins Hazelnuts chocolate bar; could this be the answer to our rum raisin chocolate prayers? At £1.40 for 100g bar, I didn’t think this was too bad. 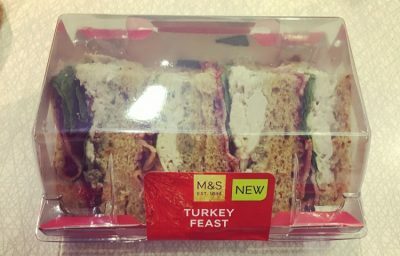 The bar was square with pretty thick chunks, you couldn’t spot the raisins as a solid bar but breaking apart, boy was it jam packed with raisins and hazelnut pieces. Now I am not usually one for nuts in chocolate, and was a little wary and bemused why you would put hazelnuts with rum raisins, but hey ho I am willing to give it a go. Milk Chocolate with original Jamaican Rum, raisins and hazelnuts. Giving the chocolate a sniff you can immediately smell the extremely inviting Jamaican Rum. Biting in, hello rum! The rum was persistent throughout and was accompanied by creamy milk chocolate and the crunch from the hazelnuts. 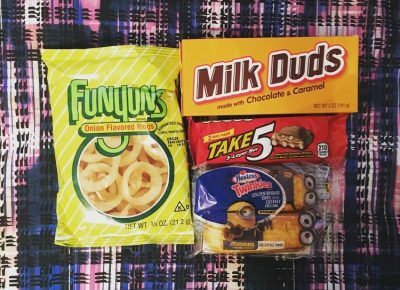 The chocolate isn’t the finest chocolate around however it is still of a good quality. I am still unsure about the hazelnuts, they aren’t offensive and to a degree complement the bar, however I would much prefer it without. The rum raisins are the clear winners here, and are a gift that keeps on giving. 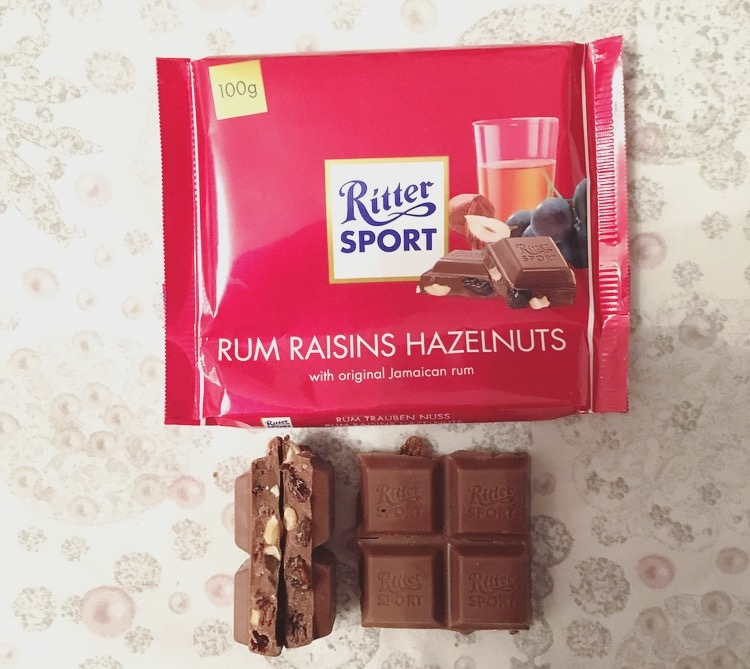 Although it is an instant and lasting taste of rum it isn’t at all overpowering and it’s nice to see Ritter Sport have used the real deal. 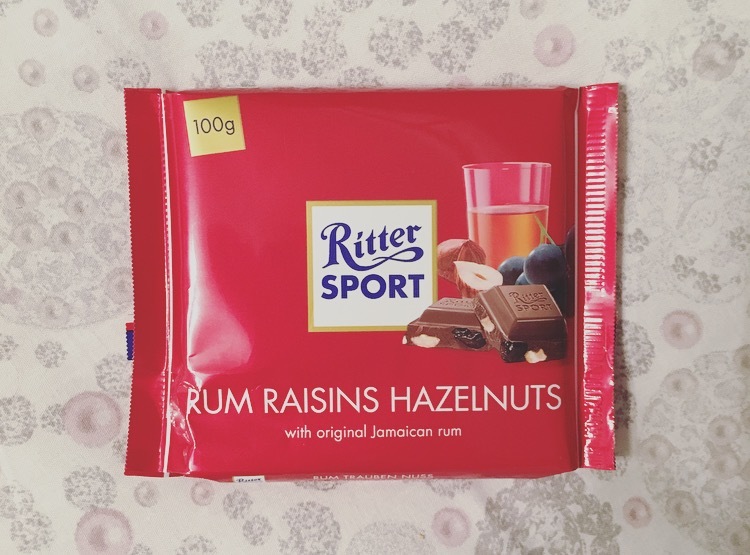 So if you are a lover of rum raisin, and have had Bournville Old Jamaican withdrawal, Ritter Sport Rum Raisins Hazelnuts is a fine alternative. Fathership has actually declared it as the best chocolate of all times!